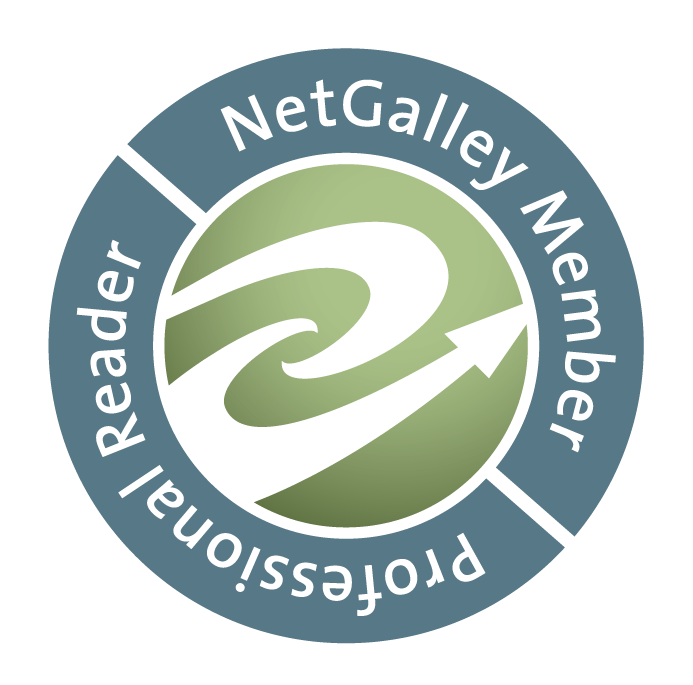 Visit Jen at Teach Mentor Texts and Kellee and Ricki at UnleashingReaders to see what they've been reading, along with everyone else who link up. Amina, a quiet but talented Pakistani-American Muslim girl holds a dilemma that others will recognize, perhaps in their own homes. She has never been comfortable in the spotlight and struggles to stay true to her cultural traditions. She loves hanging out with her friend, Soojin, but this year in middle school, even that friendship is changing. I enjoyed the honest showing of a young girl's thoughts, about her family, including an older brother with his own growing-up problems; about her religion, and the new ideas brought from an uncle visiting from Pakistan; and about her changing friendships. 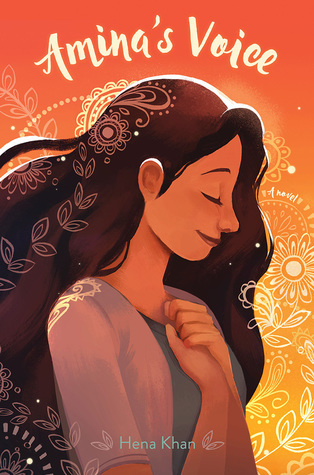 Hena Khan's writing alternates chapters between Amina's school days and her family struggles, a clever way to show those parts of a young girl's life, and ending with both coming together in a satisfying way. Thanks to Candlewick, I received a copy of this second (adventure?) in the life of the little red chicken and his Papa, again clever in the approach to the story with boisterous illustrations and laugh-out-loud conversation between the two. The little red chicken has homework and needs help. He must find and identify the "elephant of surprise" in three books. His teacher says every good story has that "elephant" or is it "element"? It's that thing that makes one say "Whoa! I didn't know that was going to happen." Papa not only continues to find a few surprises as he reads the stories, like Rapunzel and The Little Mermaid, but the little red chicken does, too. This can't be missed as a read aloud! Perhaps to describe this book, I will use words from the forward by Ashley Bryan: "I'm sure just to touch this book, We Rise, We Resist, We Raise Our Voices, will lift your spirits." 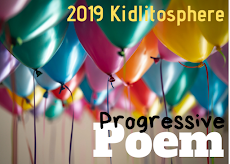 Editors Wade Hudson and Cheryl Willis Hudson tell in their introduction that they were inspired by their seven-year-old granddaughter who was so upset by the result of the 2016 presidential election. They write that she was frightened and confused, worried that her world would change. They asked themselves what could they tell her, what words of comfort could they offer? They have gathered thirty authors and nearly that many illustrators for each double-page piece to give those words of inspiration and love and hope. There is a poem by Carole Boston Weatherford, illustrated by Jeffery B. Weatherford that speaks of The Golden Rule. Kwame Alexander writes his story, illustrated by Ekua Holmes, about a night while getting ice cream with his daughter and the worry she has on the way. The editors each share a piece, Wade questions "What Shall We Tell You? with a poignant portrait of mother and child by Floyd Cooper accompanying it. Cheryl shares a quilt she created to illustrate the song, 'The Gospel Train': "The fare is cheap and all can go./The rich and poor are there./No second-class on board the train,/no difference in the fare." Ellen Oh, Margarita Engle, Hena Khan. . . I could continue on. Each piece is stunning in its message, beautiful in its art. There are brief biographies of each contributor, photo credits, and an index at the back. There is also a table of contents. I imagine how wonderful it would be to read and discuss one of these pieces each morning with a class. I have read parts to my granddaughters (seven and nine) and it's a pleasure to enjoy with them, too. If you study countries all over the world, this may be a helpful book for learning about North and South Korea. 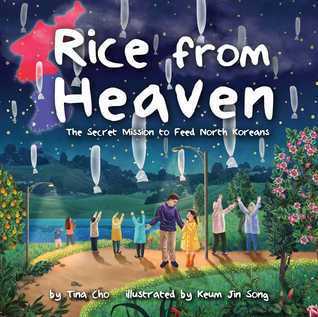 There is a story of the small group that really did launch balloons carrying rice over the mountains to North Korea, hoping that people there who are starving received them. It focuses on one young girl and her father, showing some protestors that the girl stood up to, saying that it is right to try to help. The illustrations are beautiful, full of color and realistic. The spread showing a contrast between this girl and one in North Korea shows the heartbreaking difference between the two countries. It's a rather simple story that turns out well easily, but the point is made. One must speak out and act for one's beliefs. There is quite a bit of added information about the two Korean countries and an author's note in the back matter. 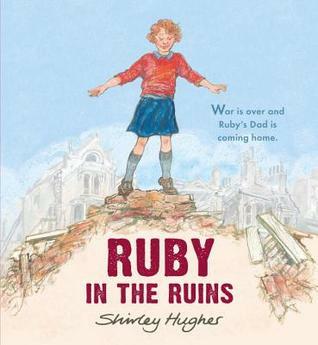 Ruby and her mother have survived the London Blitz together; now Ruby must adjust to the return of her father. In the surroundings of World War II's end in London, servicemen are returning home, and finally, after watching others reunite, Ruby's father is home. During the war, Ruby and her mother slept together, sometimes huddled as bombs rained down. Now Ruby moves to the attic and it's not exactly pretty, though promised to be fixed up when there's money. Ruby's father takes up space, an interesting observation, but when a child is only used to her mother, it's hard to adjust. She ends up having some fun playing in the bombed-out ruins, has an accident, and finally realizes her father is someone she can count on. The illustrations feel authentic to the time period and the end covers show WW II posters like "Make Last Year's Clothes Last Years". The story will generate lots of discussion points. Gorgeous paintings and a celebration of the seasons makes this a wonderful, rather dreamy story. It's a summer house, and the family says goodbye, unknowing that others will live in the house as "the leaves flutter and shake as they float to the ground" and "snow falls lightly on the roof". There is a cat, a mouse, a bird, a spider, all taking advantage of the shelter. It's a beautiful and nostalgic book, yet I had a few questions. I worried about the cat when winter came, but it seems that it came in and out, so it is not stranded. The pipes freeze, then thaw with a drip, so there is water. When I've had pipes freeze, it is a big problem. If you've read this, did you wonder about these things, too? Now Reading: re-reading and loving again Raymie Nightingale so I can then read Louisiana's Way Home. I really want to get We Rise, We Resist now. It sounds wonderful! I love collections like this with so many different pieces AND illustrations! And I need some hope and heartening up too! So hard not to despair most days when I read the news. I also enjoyed Amina's Voice though I haven't had much success booktalking it. Not sure why. I do think some of my readers who enjoy quieter books would enjoy that one. 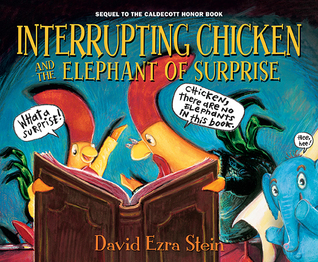 So excited about a new Interrupting Chicken book! We Rise. . . is truly terrific, Elisabeth. I'm now re-reading it a piece at a time. Amina's Voice is another good story, but perhaps students want much more action? I liked that it was a quiet story for a change. Yes, Interrupting Chicken is another hilarious and clever story. Thanks! I just read Louisiana's Way Home last week and one of the nice things about this book is that the character of Louisiana and her granny have a whole story of their own, and so if one hasn't read Raymie Nightingale in a while or has forgotten parts (like I had), it's not a roadblock to enjoying this awesome novel. Hope you enjoy it as much as I did! Also, I just put in a library request for Rice From Heaven. It looks like a great book to help readers understand more about North Korea, since it's in the news more and more lately. Have a wonderful week! I've been out for lunch, but will read your review soon, Jana. Kate DiCamillo creates beautifully interesting characters so I know I will love Louisiana's Way Home & am glad they stand alone, too. Enjoy Rice From Heaven! Thanks! I need to move Amina's Voice closer to the top of my list! And I'm so excited to her you're re-reading Raymie Nightingale in preparation for Louisiana's Way Home. I listened to the audiobook of Raymie and so all through Louisiana I heard such a strong twang, while I read it. Hope you enjoy it!! Thanks, Shaye, I know I will love it, already love the character of Louisiana. Enjoy Amina's Voice when you can. I picked up a copy of We Rise, We Resist, We Raise Our Voices at ILA in the summer, but I haven't gotten to it yet. It was good to read your thoughts about it. I haven't read The Great Blue House yet, but I probably would have similar questions. I always worry about my pipes freezing in winter, especially when I'm away! I really have love We Rise. . . As for The Blue House, I've searched other reviews & no one has mentioned that a cat is there, without food & there is a mouse, but not the cat's meal, then the water drips & finally freezes, then thaws. That isn't the way I understand it, either. And yet, it is a gorgeous book to see. Thanks, Lisa. 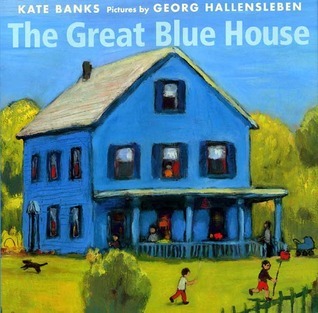 Nice to hear you have a blue house. As you see, it is a beautiful book. Rice from Heaven is good. Enjoy! We Rise, We Resist, We Raise our Voices sounds unbelievable. Thank you for sharing this title. We loved Amina's Voice - such a powerful story written in a way that grades 4-6 students can access the text. Yes, I agree, Amina's Voice is just right and not too harsh for younger readers, but the experiences are there. Hope you like We Rise, We Resist, We Raise Our Voices! Thanks! We Rise, We Resist, We Raise Our Voices was already on my to read list, but I am thankful to read your words here. They motivated me to check my library and whoopee it's on order. I will have to find this new Interrupting Chicken book too. Frozen pipes are a huge problem! We drain our pipes and then keep our house in Oliver warm enough to ensure that they don't freeze. Yep, I agree about those frozen pipes! Be inspired by We Rise, We Resist, We Raise Our Voices and laugh with Interrupting Chicken, such a fun book. Thanks, Cheriee. 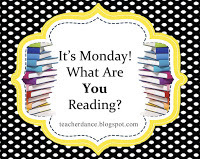 You read quite a bit this week! I just picked up We Rise, We Resist... from the library. Looking forward to some time with it! Amina's Voice is still a favorite of mine. I love what Hena Khan has created! It would be great if Amina appeared in another story as she grows older, wouldn't it? Enjoy We Rise. . . Michele. And thanks! 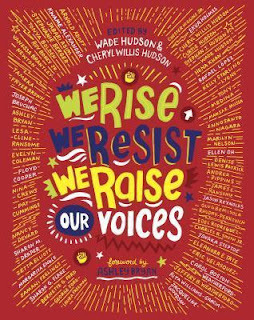 We Rise, We Resist, We Raise Our Voices is on my list! I just got the audio!!! :) I am glad to hear it is inspiring! Loved Louisiana! What a great character to bring back, and the plot took a twist I wasn't expecting! Thanks for sharing all these good books. You're welcome, Augusta. Each one was great to read! They are fun, Myra, with a loving undercurrent and gorgeous to look at , too. Yes, Amina's Voice is a good story just right for middle readers. Thanks! I just put We Rise... on hold at the library. I want to find Rice from Heaven, but they don't have it yet. Thanks for letting us know about the Interrupting sequel. My students love the original. Terrific, Crystal. Hope Rice from Heaven comes soon! Enjoy the other two. "We Rise" is wonderful!